According to the life of Dostoyevsky. At the start of his career, Dostoyevsky was a terrible writer. He was a writer nonetheless because the bar for literature used to be low in Eastern Europe. At the beginning of the 19th Century, Russian literature amounted to that which was translated from French. Contrary to how we view it now, literature was to Russians what basketball is to Jews. But from the age of 29 to the age of 39, Dostoyevsky became the greatest writer of all time because something happened that made him the greatest psychologist of all time. For lack of a more precise explanation, he had a religious experience. Dostoyevsky's ability to understand, both emotionally and intellectually, some of the most recondite psychological states—while neither validating the states nor the actions of those states—gave his readers a lens into the depth of human psychology that Western Civilization wouldn’t have had otherwise. It was the portrayal of the moral decline of Raskolnikov in Crime and Punishment that got me interested in psychology in the first place. My exposure to psychology before this was nothing more than cute stories about the priming effect and how exposure to certain music, at a certain time in our development, renders that music calming to us later on. I remember my first psychology class Freshmen year of college, in which we spent an inordinate amount of time on Pavlov’s dogs—an experiment that’s as popular as it is inconsequential. I figured psychology was a field like law, for people who got English degrees and didn’t know what else to do with their lives. Dostoyevsky grew up in an upper middle-class home, not rich enough to have a cushy life but rich enough to get a proper education. He, therefore, had the yearn of all upper middle-class types, which is to be part of the creative class. At the beginning of his career, he wanted to be a writer for no other reason, seemingly, than he wanted to be a writer. He followed the Bohemian path back when there were actual Bohemians. It’s a path we equate with the over-educated and listless youth of America's post-war opulence, but it’s present throughout history. I’d compare him to Jack Kerouac but he wasn’t that bad of a writer. The book that gave Dostoyevsky a modicum of fame was Poor Folk, which we only remember because the author went on to write way better. The novel is as anti-Dostoyevskian as The Birth of Tragedy is anti-Nietzschean. To follow the trend in Russian literature at the time, Poor Folk was overwhelmingly descriptive and journalistic. Any sort of psychological nuance was completely lost on the author, perhaps because it would have been lost on the reader. It could have been written by a computer programmed to be autistic. Thankfully, something happened to shake Dostoyevsky out of his slumber of banality. In 1850, right after Dostoyevsky’s 29th birthday, he was arrested for being part of a secret society of potential revolutionaries. This society amounted to a book club, but these were illegal in Russia at the time. They're probably still illegal now, to be honest. 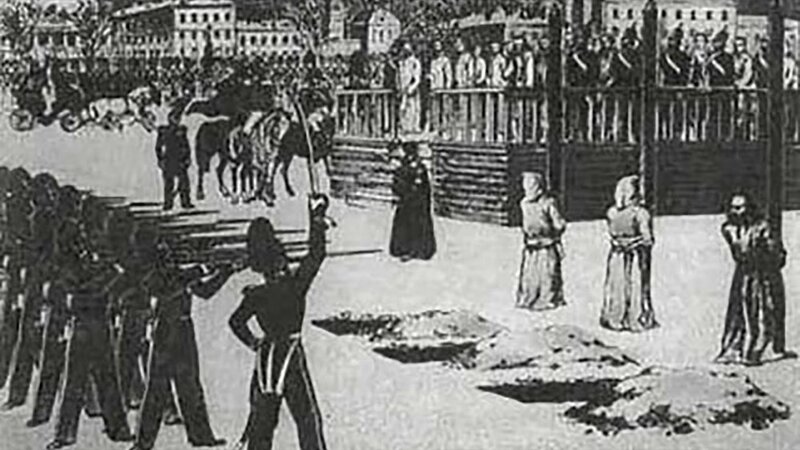 While in prison in the Peter and Paul Fortress, on an island in the Neva, Dostoyevsky was taken to be executed. They shackled him to a stake and put a cover over his head and he heard the gun load and then the explosion—but he felt nothing. Did they miss? It turned out to be a mock execution. Then he was sent to a Siberian prison for the next five years. Dostoyevsky detested what all Bohemians—proto or otherwise—detest: other people. Especially uneducated people. And in 19th Century Russia, not having an education meant being illiterate, so like East Brooklyn now. He detested, most of all, the behavior of the peasants. The drunken fights, the gambling, and the nervous disorders. What tortured him even more than being in prison was his disgust for the prisoners themselves. How could these people live like such vagrants? So like how it feels to visit West Brooklyn now. While lying in his cot one night, drifting in and out of sleep, Dostoys recalled a memory from his childhood. He remembered that one day, a wolf wandered into a nearby ravine, and the resulting conflagration of nervous energy throughout the home. He remembered, even more vividly, his own sense of deep, rotting fear. It was most likely his first experience with dread, what death would feel like. The mock execution, he later recalled, must have evoked this memory. He then remembered that one of the serfs, Marey, came over to comfort him, to show this six-year-old—who she had no obligation to care for—an unadulterated warmth he had never experienced before. It was a sort of warmth that wasn’t often expressed in Russia because it’s comprised mostly of Russians. In this state of emotional perspicacity, Dostoys broke down and cried. It was a sudden realization that he and these peasant inmates were ultimately the same. It was an instant, visceral connection with this group he previously despised, a realization that overwhelmed him with a deep and profound sense of what it is to be a human—a god who errs. From this point on, Dostoyevsky began to see the vulgar behavior of the peasants as completely rational based on their circumstances and education (or lack thereof). Of course you would get in fights to get into trouble. The peasants were going to get beaten anyway, so better to get punished for breaking a rule than at random. Of course you would drink and gamble away what little money you made throughout the week. You weren’t sure you’d ever get out of that prison. And of course you would have a nervous disorder if your life was overwhelmed by chance. Even more disturbing, Dostoys began to see that it was he who had the exact problems he, until now, only saw in the peasants. It was he who had a gambling problem; it was he who had the nervous disorders; it was he who was terrible with money. In fact, he only wrote Poor Folk to pay off some debts (and to rationalize, with a large vocabulary, why he was in debt). His life was no longer his own, rather something that was a reflection of the lives of others. Such an insight that would have repulsed him before the intercession, now elevates not only him but whatever human happens to be nearby. The religious experience ultimately entails the overcoming of resistance. It’s a neurological block that resides in the left side of the prefrontal cortex, but what it amounts to is we come up with creative ways to avoid the discomfort. While in prison, Dostoyevsky couldn’t avoid the discomfort; he had to live in it. So he had no choice but to change. The trick to having a religious experience, therefore, is to make like Dostoys and live in the discomfort, to place yourself in your own prison. To ask yourself what you could do each day to open yourself up to whatever pain you need to feel. To do without that which you hold most dear. This is counterintuitive in a culture that has been inundated with the idea that it’s vital to feel good and to be grateful all the time. The irony is that this sort of creative repression only causes more resistance. To overcome pain, we immerse ourselves in the pain. To overcome panic attacks, we increase the feeling of the panic attack. To overcome the sadness, we aggravate the sadness. To get the thing we most want to have, we do the thing we least want to do. But we'll need to first feel the dread of death before we become desperate enough to do so. If this is doesn’t make any sense, then that means you need to read more about psychology. I suggest you start with Dostoyevsky.